Durable goods orders this morning leapfrogged all economic estimates (see Durable Goods Orders Surprise to Upside, Led by Autos). 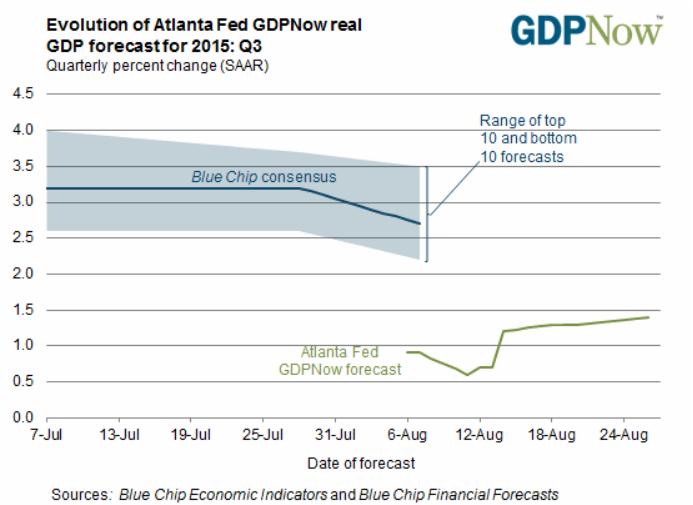 Yet the GDPNow Forecast only rose by .01%. 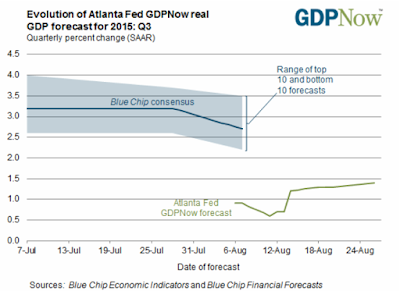 The GDPNow model forecast for real GDP growth (seasonally adjusted annual rate) in the third quarter of 2015 was 1.4 percent on August 26, up from 1.3 percent on August 18. The forecast for real GDP growth increased 0.1 percentage point to 1.4 percent after this morning's advance report on durable goods from the Census Bureau. The report boosted the model's forecast for equipment spending in the third quarter from 7.7 percent to 8.9 percent, and led to a slight improvement in the contribution of real inventory investment to third-quarter GDP growth. It's been entertaining and informative watching the evolution of these forecasts. Really big swings in some economic numbers often barely budge the expected result. GDP growth of 1.4% is hardly the material on which rate hikes have historically been based.